We have seen that the word “gospel” (euangelion/evangelium) had the principal meaning “good news, doctrine, teaching” in ancient times. This was certainly the case until the new Christian literary form of gospel as written narrative of Jesus’ sayings and doings became broadly known—that is, until the third century. The dialog furnished in the previous post showed that, still in the fifth century, the general meaning of evangelium far outweighed the textual meaning of the word. With our ability to carefully discriminate the two meanings of “gospel,” we now turn to the principal source used for the textual reconstruction of the alleged Gospel of Marcion. It is Tertullian’s massive opus, Against Marcion, in five books. Book Four is the main source and extends to 193 translated pages (1878 edition of the Ante-Nicene Fathers, Vol. 3). It is hardly possible or appropriate here—even in a long series of posts on this weblog—to offer a comprehensive argument showing that Tertullian is not familiar with a textual Gospel of Marcion. 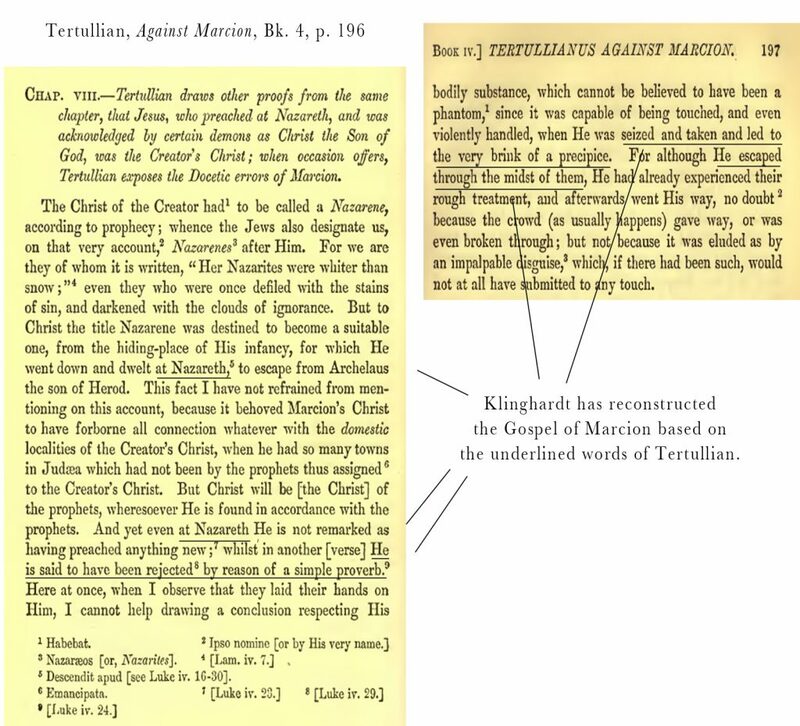 What I propose, however, is to furnish a couple of typical examples from Tertullian’s writing, passages that M. Klinghardt considers ‘good evidence’ for Marcion’s text. Those examples, however, clearly show that the modus operandi of scholarly textual reconstruction is false: in fact, nothing in Tertullian’s writing points to a text by Marcion at all. Tertullian is merely rebutting Marcion’s doctrine by using Luke’s text. A cursory reading of the passage above (online here) shows that Tertullian is primarily combating “the Docetic errors of Marcion,” as the editors (Roberts and Donaldson) have correctly observed in the heading. Using the Gospel of Luke, the Church Father emphasizes the place Jesus was raised (Nazareth) and specifically the incident in Luke 4 where Jesus is seized by the crowd in the synagogue and led “to the very brink of a precipice.” Tertullian argues that these material aspects of the Lucan story are proof against Marcion—for Jesus’ body “cannot be believed to have been a phantom, since it was capable [in GLk] of being touched,” etc. Thus, Tertullian is combating Marcion’s doctrine. Of course, the Church Father does not comprehend the monumental circularity of his procedure—for he argues from the canonical gospels in order to prove the veracity of those same gospels—and also in order to disprove Marcion’s theology. There is, of course, nothing in Tertullian’s prose above to suggest he has any knowledge of a written gospel of Marcion. Even less can it be inferred that the canonical passages Tertullian uses against Marcion were somehow in a written gospel by Marcion. That such a strange conclusion obtains in scholarship must be deemed astounding. This is an error. The ancients were using “gospel” in the general sense, and hence the only “mutilation” imputed to Marcion was that of deforming the true doctrine. Klinghardt, on pp. 464 f of his 2015 volumes, considers the above long passage of Tertullian. In boldface, Klinghard notes that Tertullian has mentioned “Nazareth” several times, that the Church Father mentions a proverb, the rejection of Jesus, his being seized and led to a precipice, and his escaping “through the midst of them” (all passages underlined above). On these bases—and apparently on them alone—Klinghardt posits that all these elements existed in a written Gospel of Marcion. Indeed, in Klinghardt’s view (p. 464), these elements are “Gut bezeugt” (well attested) in the written gospel of Marcion. However, the only correct view is that the elements are “Ganz unbezeugt” (entirely unattested)! In the above passage, Tertullian also draws on the Gospel of Matthew, e.g., when he mentions Herod Archelaus (cf. Mt 2:22). This is not in the Gospel of Luke, and hence—to follow the reigning scholarly logic—we would have to infer that the Matthean passage was also present in the Gospel of Marcion. But this would conflict with another scholarly preconceived notion, namely, that Marcion drew only from Luke. Hence no mention is made of Matthew’s gospel (not even in Klinghardt’s analysis). This is all, of course, based in deeply held scholarly notions and not in the actual evidence furnished by Tertullian. It is tendentious from beginning to end. Tertullian is quite plainly saying that Marcion’s theology of a spiritual Christ excluded “all connection whatever with the domestic localities” of Jesus. This is quite clear when we understand (as did Tertullian) that Marcion’s Jesus was spiritual/without a body. Thus, “Nazareth” (and other localities) could not have appeared in any gospel of Marcion, textual or otherwise (and Tertullian does not suggest it did so appear). The fact that Nazareth and other places do appear in the reconstructions indicates that those modern scholarly reconstructions violate both Marcion’s theology and Tertullian’s own intentions. Klinghardt and other scholars have simply not seen the forest for the trees. They have not paid attention to the spirit of the heretic’s theology or to the letter of Tertullian’s writing. They have been too busy chasing the chimera of a written Gospel of Marcion. But doesn’t Tertullian also say he will use the heretic’s OWN Gospel against him, a Gospel which T says M does not dispute? And this is why Knox et al assume that, when T quotes Luke, these passages are in M’s document version of Luke? Yes, T does write this. All depends, however, on how we interpret “gospel” (doctrine, or written text).—R.S. I suppose the “Law-document” is some part of the Hebrew scriptures (the Torah?). I understand “gospel” as being Marcion’s theology, and “law” as being (broadly) Torah/Jewish scripture/Tanach. The word “documents” fits neither, and here I invite you (or anyone interested) to consult the Latin. I fear that the English translations we are working from may be unsatisfactory.—R.S. The Latin says “instrument(i)”, usually translated as document. I wouldn’t know, but “instrument” sounds more like a physical thing (a document) than an idea or theory, and I just have to trust the translators. In my Nazareth research I learned not to trust, but to check the primary data for myself–with surprising results. I think the same skepticism is warrented here and suspect a ‘translation bias,’ because a text is imagined at all times. Being no Latin scholar I personally will defer that investigation.